The damage values in the research lab are all wrong. If you want to know the real values have a look on the dataminer webside. NOTICE: My Upgrade Is Complete! 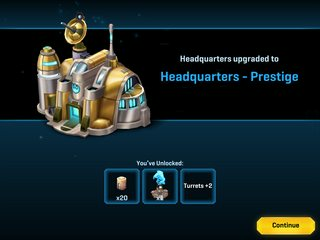 Once you upgrade a Production Building (Barracks, Factory, Hero Command, Starship Command) to Prestige Level the related HQ Inventory Units will automatically Upgrade to Prestige Level. I just got my Prestige Level HQ today and noted my In-Game Chat Name still showed me as a Blue HQ 10, even after several Reboots. ⇨ I then Upgraded 1 Wall to Prestige Level and Rebooted. For the Durasteel Crate is Donate/Receive 156 units -- maybe we should build AT-ATs and Jugs again only to donate/receive objectives? I don't care about Daily Objectives since I reached HQ 9... But are they kidding with the 35 twileks? JARJAR - Good reason and hence the suggestion from most to Upgrade all Walls to Prestige Level FIRST and then you won't have that issue. BECAUSE War Base Editor goes directly into Layout Mode it does not have the [Hide / Show] Button like the PvP Base Editor (seen prior to selecting Layout Mode). **NOTE: The [Hide / Show] Button disappears after all Walls have been Upgraded to Max Possible Level. Not hard to see what day Prestige came out... I don't know if this was Disney's last move or Zynga's first but either way, it is working... There is also a separate page for apple, but just posted the GooglePlay version of the game. I noticed that this morning too. Also, will be interesting if they make EP events even harder for Prestige level players.